I was a little suspicious starting out this book. It was a melee of fantasy and historical fiction. In some ways, it works; other ways, not so much. In my opinion, LaFevers should have chosen one or the other, and it should have been fantasy. In Grave Mercy, LaFevers talked of the Catholic Church and how it spread to the area of France and Britain and Brittany specifically. The beginning went into the history of how this area went through the change from pagan worship to Catholicism. In this time period, she described some nuns hiding behind the facade of Catholicism in order to still hold out the pagan rituals -to the extent that there were nun assassins. Though part of that is true, and that is why we have the idea of praying to Saints in replacement of pagan worship, I found that there were too many fantastical elements to call this book historical fiction. Compared to my interest in the plot, my love for the characters were secondary. I am a firm believer that your love for the characters should far outweigh your love of the plot, and that the plot should only enhance your characters; however, I found that it was the opposite for this book. A) De Lornay and Beast de Waroch were some of my favorite characters in the entire book. They made sense. Their reasoning and thought processes were realistic and logical. I only wish that there were more scenes with them. I feel like if they were in more of the book, they would have brought so much more to the plot, but they were barely secondary characters. B) Duval was probably my second favorite character underneath De Lornay and Beast de Waroch. He was the epitome of the romanticized medieval knight. If you go back into your classic medieval lit, you know that these kind of characters hold chivalry above all, and that is definitely a good description of Duval. With this characteristic, I would imagine that his character would be quite unbelievable, but he was actually more believable than I had originally assumed he would be. He wasn’t as unbelievable as Sir Gawain and the Green Knight, so I would say that he was a good male protagonist, though still lacking in areas. C) Ismae. Okay, so she was a character riddled with holes. Her character was more unbelievable than Duval’s, which I found interesting. As for her background: she did not grow up in the convent, she was abused by her father, and sold as a wife to a pig farmer. Luckily, she was able to escape to St. Mortain’s abbey, where she studied for three years to be a nun assassin. Just after those three scant years, she becomes a cold-hearted assassin that lives to spill blood. Let’s be real; how can three years turn you into a killer just like that? I felt like all of her character development happened in the first four chapters, and it was poorly looked over in leu of the excitement the rest of the plot brings forth. There was no continuity between the life she had prior to the convent and the life she has in the bulk of the novel. I don’t see the chipping away of her humanity, which is what I would assume to see if she’s still in the tutelage process of her assassin schooling. Her desire to please the abbess and nuns were extremely misplaced in the beginning. Not only because she never questioned their actions specifically but because the author does not explain why Ismae is feeling this way. Ismae just repeats herself by saying that she wants to please them, to serve Mortain, and repay them for this new life she has, but I want more. I wanted more about why she truly desired this life —like deep down psyche why she wanted this. I do not feel that LaFevers actually showed her thought process on this subject, which, had she gone more in depth, would have made the book so much clearer and Ismae’s reasoning more valid. I wish LaFevers would have gone through more detail in the beginning when she began to learn at St. Mortain’s abbey. 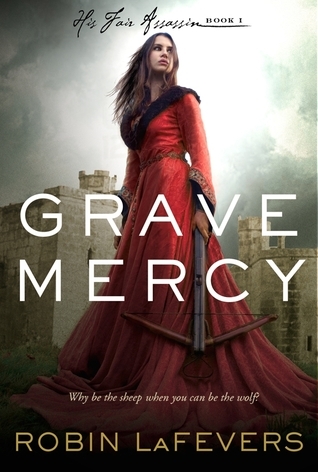 She could have probably written an entire book over just that portion, and left the bulk of Grave Mercy for a sequel. I think that would have been smarter to do, because she would have been able to flesh out her character much more. It would have also developed Ismae’s perspective, character, and the life with the nuns at the convent. 3. What’s up with this first person POV and present tense style? On this account, I am not pleased. It was written in first person perspective —while I already have an issue with this, it makes it worse when she adds the present tense style. I do not think that this was a good POV to use nor was present tense an appropriate choice. I think it threw off the genre and time period she was writing in. I generally don’t like reading books that are in first person POV, but I deal with it and have read many good novels that have this perspective, but I would prefer third person, past tense —especially for this genre and time period. You can write it with more ease and more accuracy. I think doing so would have represented the time period and set much better. Not to mention that most writers who write in this way do so because it’s much easier to convey emotions; however, LaFever rarely describes any feeling and thought process. Because of this, the dialogue fell flat. I know it’s kind of the cool thing to do, but there are only certain books that can pull it off, such as The Hunger Games, but LaFevers shouldn’t have tried. It was a wreck. Overall, good story. People should be aware of it on the YA shelf. At the beginning, it comes off as very anti feministic but slowly changes its tune by the end. However, there was a strong Marxist Feminism undertone to the entire novel. This was a very thought provoking book thematically. *Note to parents and educators: I would not use this book in the classroom, and I would be very careful about recommending it (especially to young readers). Though if I were teaching upper high school, I might have it available on my shelf for them to read.